Not the Tiki Ti. 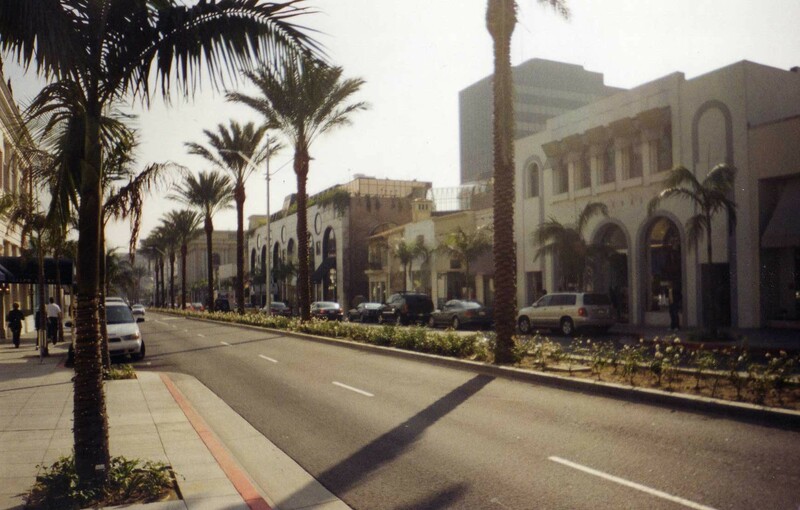 (Actually, it’s Rodeo Drive in Beverly Hills.) All photos of me at the Ti are far too incriminating for public viewing. This article originally appeard in the Hamilton Spectator, February 2008. Chris, my friend and tour guide while I was in Los Angeles, had ordered a death sentence of tequila. Called the “Blood and Sand,” I swear it’s a drink meant for those with numbed taste buds, livers of steel, or just a serious desire to do a face-plant into their peanuts. As I watched in horror, the bartender set a cocktail down in front of us, glowing purple and reeking of sugary rum. With a dramatic flourish, he raised a bottle of Jose Cuervo in the air, its spout in the shape of a bull’s head, and began pouring. And pouring. And pouring. Soon the mug was overflowing with tequila, and as he poured, the other customers yelled out “Toro! Toro! Olé!” with such ferocity I felt like I had stepped into the ring at a Barcelona bullfight and not into a pub in Hollywood. And so began our night at the Tiki Ti – an itsy-bitsy Polynesian-themed watering hole on Sunset Boulevard that looks like a tropical vacation-themed garage sale. Lit by Christmas lights and blowfish lamps, and decorated with dashboard hula girls, Tiki figurines, and a neon Buddha fountain, it is at once deliciously tacky and charming. The place is small, with only a handful of tables, a dozen bar stools, and a maximum capacity of 50 people. A far cry from the clichéd LA images of Cristal, paparazzi, and DUIs, the Tiki Ti is instead a friendly, cozy, family-run tavern, where autographs of regular patrons – not celebrities – adorn the walls, and the no guest-list, first-come, first-served motto applies to everyone. The night we went, like any night, the crowd was an eclectic mix; blue-collar after-work types lined the bar and chatted with staff, a group of college-aged partiers sat around a table littered with empty glasses, and a quiet couple clearly on their first date whispered in the corner. Unlike the flighty trends of LA, the Tiki Ti is a piece of history, a nostalgic tavern that’s been getting people soused way before Paris and her friends were even a glimmer in Grandpa Hilton’s trust fund. Opened in the early 1960s during Hollywood’s love affair with luau culture, it has steadily survived while all of Tinseltown’s other tropical bars faded out, maintaining a fiercely loyal customer base not usually seen in this land of glitter and glam. The story of the “Ti”, as it’s often called, begins with the bar’s founder, Ray Buhen, who had his beginnings as one of the famously nameless drink mixers at Hollywood’s first Tiki bar, Don the Beachcomber’s. From 1934 to 1937, Ray, along with a team of three others, worked as behind-the-scenes mixologists, creating now standard drinks like the Zombie. While Don’s may have been given all the credit for its tropical sensations, it was this group of anonymous mixers who knew the recipes. Over the years, Ray moved around town to various other Polynesian bars, establishing a reputation as LA’s star drink master, until he eventually opened his own place, the Tiki Ti, in 1961. After Ray’s death in 1999, the Tiki tradition was passed on to Ray’s son and grandson, Mike Sr. and Mike Jr., who not only now own the place, but are also the bar’s only employees, and do everything from prepping before the doors open to cleaning up after closing time, all the while mixing up their family’s countless lethal drinks for loyal customers in between. It is that sense of family (not to mention the unique beverages) that keeps bringing customers back to the Ti, and they are not only fixtures on the stools, but are fixtures on the walls as well. The shelves behind the bar are adorned with tropical souvenirs donated by loyal patrons over the years. In fact, the Buhen’s collection of donations is so large they have to rotate the display. Over the years, this devoted customer base expanded to include old-school Hollywood actors such as Marlon Brando, Burt Reynolds, and Jack Palance. Mike Sr. happily told me the story of one of their more recent celebrity sightings, when Nicholas Cage stopped in and two regulars bought him a “Green Lizard” – a toxic mix of 151 proof rum and 110 proof green Chartreuse (a potent liqueur made from secret herbs and brewed in a French monastery). “His eyeballs kind of popped out after that,” said Mike. I asked if he had ever braved the mixture. With little thought to what I was in store for, I ordered up an “Anting Anting,” who’s name apparently refers to a legendary Filipino amulet that promises the wearer invincibility. I had no idea what was in it, and I highly doubted it would make me invincible, but it tasted fantastic, so I guzzled away. The catch is, with more than 80 tasty boozy concoctions, a night at the Tiki Ti can pack a pretty potent punch. The family keeps their recipes closely guarded, and the bar’s menu doesn’t explain what any of their drinks are made of, which makes first-time ordering like a game of Russian roulette. As for my drinking buddy Chris, well, by the time he had finished his tequila, his legs were a bit wobbly, his eyes were a bit hazy, and he looked ready to do that peanut bowl face-plant. It appeared as though my tour guide was now unable to guide. So, I did the only sensible thing and ordered us another round. March 15, 2011 in United States. Tags: alcohol, California, Hollywood, Los Angeles, U.S.A.
← Letting loose in Louisiana: Happy Mardi Gras!